Membership in the Toronto Marine Historical Society provides a subscription to the journal, Scanner, now in its 51st year. Scanner is published eight times during the membership year which runs from October 1 to September 30. It keeps members up to date on Society affairs. The first section is a brief digest of news events significant to the ongoing historical record of Great Lakes shipping. Each issue is anchored by a major research piece entitled Ship of the Month. Recent ships of the month have been Liquilassie, Albert C. Field and Peerless. 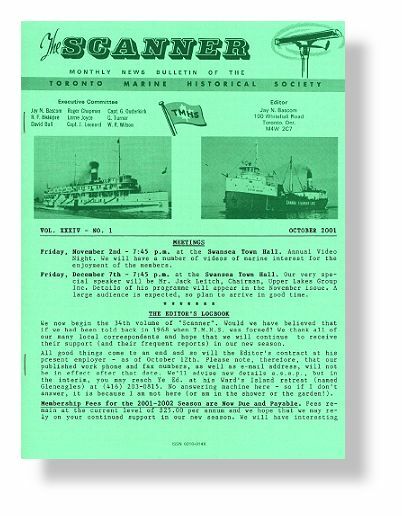 The magazine concludes with a special Great Lake Memories section that is a reproduction of a genuine historical artifact, frequently a brochure from the days of Great Lakes passenger steamships.